The following is a review of Nature's Beautiful Order from Memoria Press with the TOS Homeschool Review Crew. We keep discovering new books from Memoria Press that seamlessly fit into our homeschool plans. This most recent set is a science reader, workbook, and teacher's answer book all about animals. It is recommended for 6th to 9th grades, and my 7th grader wrapped up his school year with this change from his previous science lessons with my mom. I questioned if it covered biology at first as that was my tentative 8th grade plan for him, but it is different from a biology text. This set is broken into chapters, most devoted to a different bird, insect, or mammal, and ending with man. Chapter 16: Farm Friends was my favorite chapter. We live on a farm. The beautiful orderliness of God's design is indeed evident all around us. From newborn kittens and freshly hatched baby chicks, miraculous new life is often present. This chapter shares how our country has changed from many families having farms to now taking field trips to working farms. Cows and pigs are focused on in this lesson. Our own dairy cow is a sort of pipe dream for us; I love fresh milk and all of the things we can make with it. * Describe the composition of the beehive. * Is the hexagonal design of the honeycomb significant? * What lesson may we take from the bee as a social animal? If you read my review of the American History set from Memoria Press earlier this year, this set is very similar, though without the accompanying flash cards. Instead of the vocabulary and short questions of the history workbook, these questions are all open ended questions. The student reads a selection from the book then works through the corresponding pages in the student guide. I required complete sentences in the answers written in the student guide. After my son completed them, I then checked his answers with the teacher key. These lessons were relevant to our life and interesting to read, both for me and my son. He was able to read and complete the workbook independently and then I discussed the information and reviewed any incorrect answers with him. I recommend this a a great middle school science curriculum. For us, it is the perfect precursor to biology. 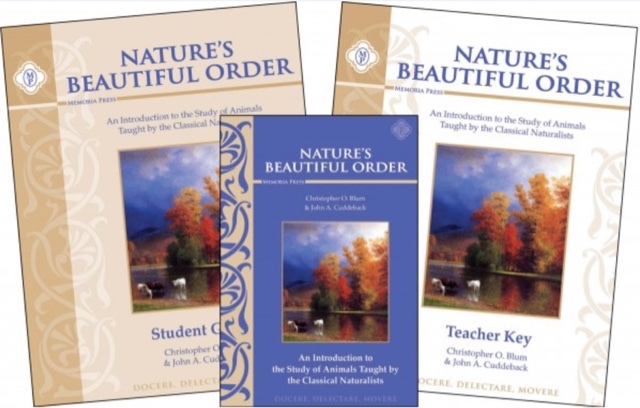 We reviewed Nature's Beautiful Order but Memoria Press also offers Latin Curriculum from Early Elementary to High School. I noticed that they also have a brand new biology curriculum!